The NovoCon S Digital Actuator is a motorized, modulating digital actuator that combines the functionalities of a digital actuator, bus communication device, flow indicator, and data logger. 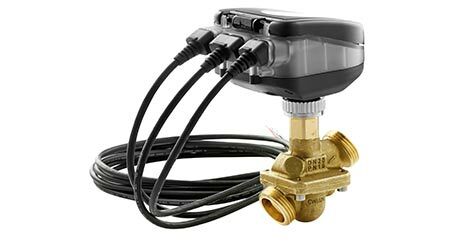 The 4-in-1 digital actuator is engineered to fit onto the Danfoss AB-QM pressure independent control valve to provide precise control and communication between a hydronic system and a building automation system. The NovoCon S digital actuator enables a connection to a building automation system via Fieldbus, which allows information to be collected from each individual actuator. By using Fieldbus cables with pre-fabricated plugs for daisy-chain connections, wiring is minimalized and the risk of fire is reduced. And, by making features such as commissioning, flow indication, and flushing remotely available, time and costs can be saved on installation and commissioning and daily operation and maintenance. NovoCon S also enables status feedback and alarms for instant troubleshooting and, by facilitating the collection and storage of data, facilitates the benchmarking and real-time tracking of building performance and energy consumption for ongoing efficiency improvements and cost savings. The Danfoss AB-QM pressure independent control valve (PICV) is an all-in-one balancing valve and differential pressure controller, providing 100 percent valve authority, accurate flow limitation and precise system control of hydronic systems. Available in a full range of sizes from ½-inch to 10-inches with a compact design able to handle any size application, the AB-QM is ideal for small spaces such as fan coil units and VAV boxes, as well as large buildings like offices, universities, hospitals, and buildings where accurate temperature control is critical, such as laboratories and research facilities. The AB-QM has third-party verified balancing and control accuracies of ±5 percent of setpoint. Compared to traditional balancing valves, it eliminates the need for authority calculations and will save time on installation and commissioning.